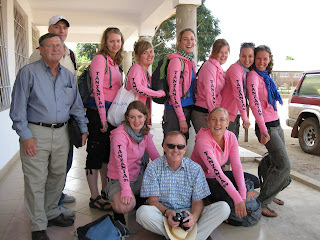 In June 2009 a group of students and professors from Oregon Institute of Technology (OIT) went to southern Tanzania to explore the possibility of helping out villagers with safe drinking water. 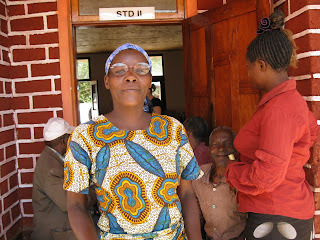 They witnessed for themselves the bad water that people use by testing different sources for bacterial contamination. 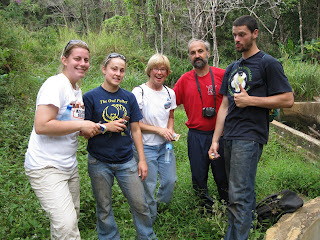 In the photos: Left photo, from left are Andrea, Mackenzie, Dr. Herriet, Dr. Mike, and Robert. On the right photo: Robert and Dr. Mike Cornachione of Oregon Institute of Technology with Br. Buza of St. Maurus Hanga Abbey are repairing a broken hand pump at Mputa village in southern Tanzania. Bottom picture: the OIT group witnessed people drinking from very dirty stream! The OIT group is fundraising to get funds to help buy and install a pump at Mingi village. The group is doing their project in conjunction with Engineers Without Boarders. 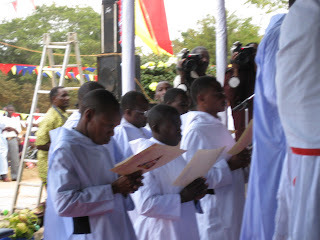 Brothers Yohane wa Sahaguni, OSB, Onesmo Sanga, OSB, and Octavian Masingo, OSB, made their perpepetual solemn vows on the same day, July 11th 2009, when Bishop Placidus Nkalanga, OSB celebrated his 25th anniversary of monastic life. 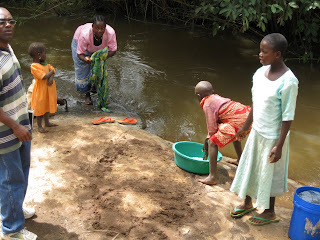 River water is for all domestic use which include laundry, cooking and drinking!! 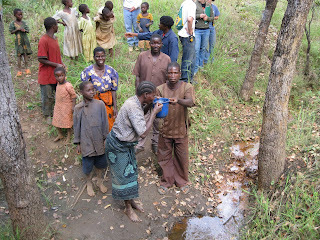 Many people use unsafe drinking water from rivers and open wells. The slide picture shows bacterial culture of water from rivers and open wells. 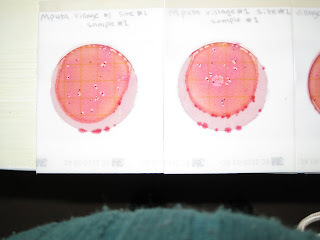 The sources are contaminated with a lot of bacteria! Hanga villagers get spectacles for free!! 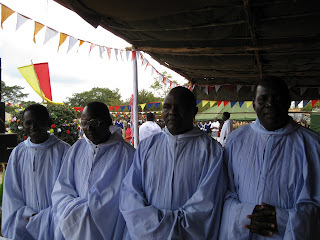 On July 23 2009 deacon Frater Anthony Mutare, OSB, a native of Zambia was ordained to priesthood at Katibunga monastery (a priory foundation of Hanga Abbey) in Zambia. 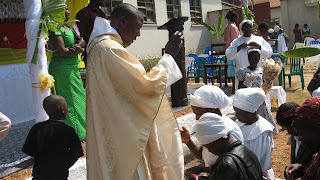 He is the second priest of Hanga from Zambia. Fr. Anthony completed his philosophy and theological studies at Salvatorian Institute in Morogoro - Tanzania. In the picture Fr. Anthony is giving his first blessing as a newly ordained priest at Katibunga. .. . . . . . . . . . . . . . . . . . . . . . . . . . . . . . . . . . . . . .
With him four monks also celebrated 25th anniversary of monastic life as monks at Hanga abbey. 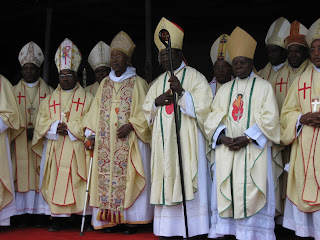 The Brothers are Jerome Mlelwa, OSB, George Luganga,OSB, Yohani wa Msalaba, OSB and Lucius Matembo, OSB.